Hi there! This is Simon Viklund of OVERKILL Software again. We have developed a robber co-op action FPS called Payday: The Heist and it's coming out later this month. Yesterday I wrote this piece about the "basic" enemies in the game - the "meat and potatoes" of the law enforcer army that stands between you and the money (and a safe getaway) - today we're going to start looking at the special units in the game! Special units are - as you may have guessed - tougher-than-normal enemies with unique attributes that make them trickier to defeat. In Payday, you have the guy on the radio (Bain) warn you if he's intercepted some message on the police radio indicating that a special unit is being deployed. In case you miss this you might hear a nearby law enforcer shout something like "make way for the Shield!" Each special unit also makes its own unique sound to indicate its presence. In Payday, all special units can be "tagged" by using the "shout-out" command. This outlines that unit so that you and all your teammates can see the enemy even through walls for a few seconds, and thereby more easily focus your tactics and firepower to take him out. This is the Shield, and it's not tricky to guess why he's called that. 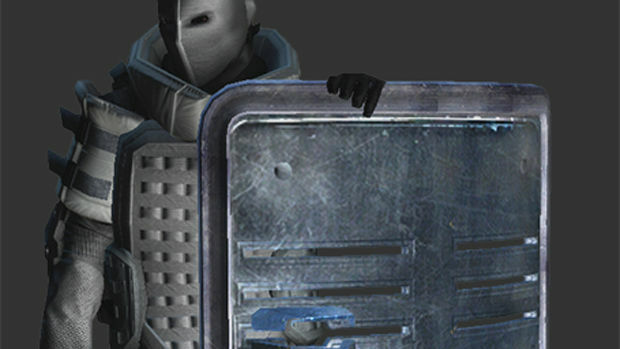 The riot shield he's carrying is extremely durable and cannot be penetrated by any weapon. We've seen people foolishly run up to the Shield trying to take him out - or possibly make him drop his sheild - with a melee attack, but that just doesn't work. He's quick to rotate too so circling around him all by yourself is also for the most part useless. One of the fundamental ideas behind Payday is to encourage teamwork and throw challenges at the players that require them to cooperate. The Shield follows this design principle in that the best way to take him out is to split up and attack the Shield from two different angles - effectively flanking him. The levels in Payday are designed to allow alternative routes from one point to another, allowing you to flank a Shield even if he has positioned himself in a narrow corridor. Trip mines is also very effective against Shields. While Shields are deployed randomly from the police's first assault wave and go in with the objective to simply track you down and make whatever situation youy're in a living hell, Shields can also get orders to guard specific key positions. More than once we've been running out of the vault in the First World Bank heist - thinking that since we shot our way through the ambush the SWATs had set up in the vault corridor, we're home free - only to be stopped dead in our tracks by a couple of shields waiting for us in the lobby! Even as developers, our own game constantly surprises us! Return tomorrow to read about the special unit called the "Cloaker".